When I got my first experience with subwoofers, working for Video Magazine back in the early 1990s, I noticed that some had drivers that fired forward, while others had drivers that fired downward or to the side. I assumed that because the subs were in most cases reproducing frequencies below 80 Hz -- with wavelengths of 14 feet or longer -- that small changes in driver orientation wouldn't matter much. 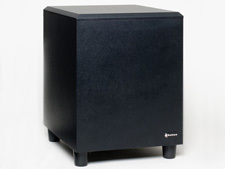 Considering that most respected subwoofer manufacturers offer front-firing and down-firing designs, and that I've heard both driver configurations deliver excellent sound quality, I never really gave the subject much thought. Yet I've read comments from some audio enthusiasts who claim that front-firing subwoofers are better. And I've had a couple of manufacturers tell me that some of their customers have firm opinions on the matter. Recently, a soundbar manufacturer asked me for my opinion on the subject, but I decided I should give him more than just opinion. As luck would have it, I had not only a couple of tiny soundbar subwoofers to test this with, I had a pretty good standalone down-firing sub: Outlaw Audio's M8. I decided to measure the frequency response of the M8 in two ways: with the driver and port pointing down, as the sub was designed to be used; and with the driver and port pointing toward me. Well, not toward me -- toward the MIC-01 measurement microphone that goes with my Clio 10 FW audio analyzer. The microphone was placed at the same height my ears would be if I were seated, with the stand in my listening chair. Because a subwoofer is always used with a low-pass crossover filter to remove the mids and highs, I used the M8's internal crossover and set it to roughly 100 Hz. You can see the frequency response graph at right (click on the graph to enlarge it). Frequency response, if you don't know, is a measure of how evenly an audio product responds to different frequencies of sound; typically, you want the product to respond evenly to all frequencies within its intended operating range. Below 80 Hz, there's almost no difference in the response: just a few deviations of +/-1 dB or so. At such low frequencies, that's probably barely if at all audible. At higher frequencies -- where the sub's output is starting to be attenuated by the crossover anyway -- you can see some larger variances that might be audilble. But neither position delivers measured performance that could be considered clearly superior to the other. I also measured the impulse response, which is the response charted over time instead of by frequency. The impulse response is shown in the graph at right (click it to enlarge). Here, we see some differences. The front-firing configuration seems to have a slightly faster response, with a sharper rise on the first cycle. Its sound reached the test microphone about 2 milliseconds quicker. To put this in perspective, sound travels at about 1 foot per millisecond, so this is like moving the subwoofer about 2 feet closer to you -- and that could subtly affect the blend you get with the main speakers. However, the waveforms from the two different positions are more in sync after the first cycle, and the waveform from the front-firing subwoofer doesn't look quite as clean. My results with two soundbar subwoofers were similar: minor variations that were likely to be barely if at all audible. I can't say from these tests that the front-firing configuration outperforms the down-firing configuration, or vice-versa. I can say they might sound slightly different -- which isn't a big surprise if only because the front-firing position moves the driver slightly closer to you and also changes the way the driver (and port, if it's on the same baffle as the driver) couples acoustically with the floor. But you'd likely get at least as big a difference in sound by moving the subwoofer 1 foot in any direction. And spending the time to do an accurate subwoofer setup -- choosing the placement and crososver setting using measurements confirmed through listening evaluations -- will probably do more for your sound quality than fretting about which of these two configurations is better. If you're really serious about your subwoofer, in my opinion a decent DIY measurement system is the best investment (an OmniMic, say, or a USB mircophone and a laptop running Room EQ Wizard) you can make.